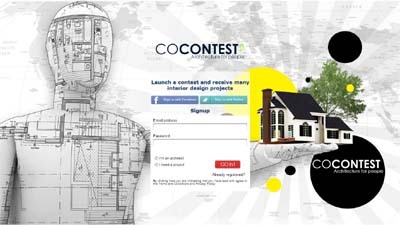 Cocontest is a crowdsourcing platform for all those end users in need of new design ideas or projects for renovating their house/office. Architects compete in design contests with cash rewards and specifications set by end users. Cocontest is useful also for companies in the real estate market as a new outsourcing channel for low cost projects. It is especially a great opportunity for junior architects who want to emerge.. The goal of Cocontest, using the words of the founder, is: “to revolutionize the world of architecture and the relationship between client and architect, breaking down geographical barriers, with the intent to achieve the goal to give a high quality architect to everyone.Our objective is to make CoContest an important pole for architecture, ranging from architecture to interior design contests. Following the trend of what is going on for many services that are increasingly developed online and less offline, with the prospects to whoever needs an architect for their home projects to find the answer on the internet and thanks to our model improve the architectural business online.